Have you ever met someone that you found attractive and all of a sudden you begin rambling? It could be within the first few brief encounters you had with them or you talked with them a million times yet, this time he just happened to look you in the eyes? You just had a 'Say Anything' moment. Very similar to the character Lloyd Dobbler who was played by John Cusack in the movie 'Say Anything', you just kept talking so that you could not only convince the person you were talking to but yourself that you deserve to be in the conversation. Whatever 'Sophisticated Stage' you might be at during a relationship, there is always one moment when you completely lose it. Or do you? Could that moment convince someone that you are someone they want to go out with? 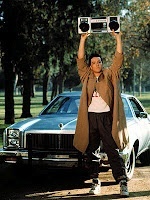 In Lloyd Dobbler's case, he won over the girl with his honesty by making her laugh with his first 'Say Anything' moment. Vulnerability and imperfections are vital to finding the right person. How many times have you had problems in a relationship or even a problem finding a date because you and everything around you had to be perfect? The best judge of whether or not to marry someone? Do something embarrassing but appropriate in front of your soon-to-be husband's parents and if he smiles, he's yours. Some people are single because they are afraid to be vulnerable or have people get to know their imperfections. The fear is that once the vulnerability and weaknesses are shown they will be rejected. So, they won't say anything, not even 'hi' to that good looking and seemingly nice stranger. There is a wall that is built so that someone can knock it down. A relationship is not built out of thin air and if two people put up a wall then there is a good chance nothing will develop. Do 'Say Anything' moments end once the beginning stages of a relationship continue? Nope. They change. They change into moments where you need to have a discussion about something that may be bothering you. A relationship can be like two people standing on the opposite ends of a room with a carpet between them. The more 'things' meaning feelings, wants, and needs that go unspoken, the more dust accumulates underneath the rug until there is so much between you, the carpet becomes a wall. As a relationship continues those 'Say Anything' moments become those times when you need to fight with each other and fight for the relationship, disagree, discuss, or just be silly or stupid, the independent and unique voice that other person fell in love will keep the relationship strong.